Acrylic Single Display Bin For Slatwall and Wire Grid Wall are a smart choice for displaying small items ranging from cosmetics to CDs. 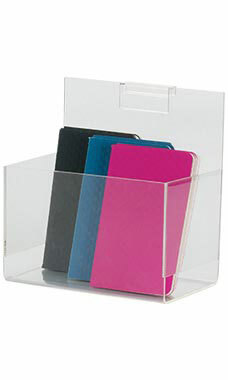 The single display bin is a clear acrylic plastic that will provide years of see through capability. The bins come standard with an attachment for easy installation onto your slatwall, slatgrid or wire grid wall. Display Bin dimensions are 7"L x 4-1/2"W x 4-1/2"D.